This is what happens when you give cat lovers power. They start going nuts with it. There's the savannah cat, which is a mix of domestic cat and the wild African serval, making a pet that is both better equipped and more inclined to rip one of its owners ears off than any cat before it. There's the liguar, which was a lion's head on a jaguar's body. After that it's not even about looks anymore - its about language. The names made up for these species sound like a Lewis Carroll nonsense poem, and over generations the words get ever more entangled until there are things called leoliguards and lijaguleps. 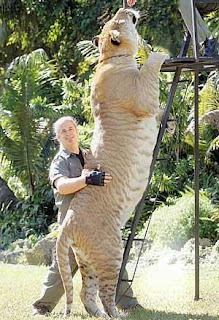 King of the big cats is the liger, a lion father and tiger mother bred together in a way that enhances both species' gene expression for size, resulting in a cat that's about ten feet tall and nearly a half a ton in weight. The only other cat that can compare is part of the fossil record. The liger harkens back to the days of megafauna. It wouldn't even consider a human a snack. . . I want one. And also a zony.